Foreign policy is a delicate thread. It requires a certain attention to detail that many in politics today simply don't have. The situation in the Middle East, of course, is especially vulnerable: too hawkish, and alarm bells are triggered; too compliant, and you run the risk of losing control of whatever weight you carry in the region. With the constant threat of ISIS looming large in the background and negotiations with Iran constantly plagued by political buffoonery, the 2016 elections will prove more important than ever — and the onus is on voters to pick just the right candidate to take on the job. Unfortunately, the foreign policy stance of Sen. Marco Rubio (R-Florida) has frequently come under fire. 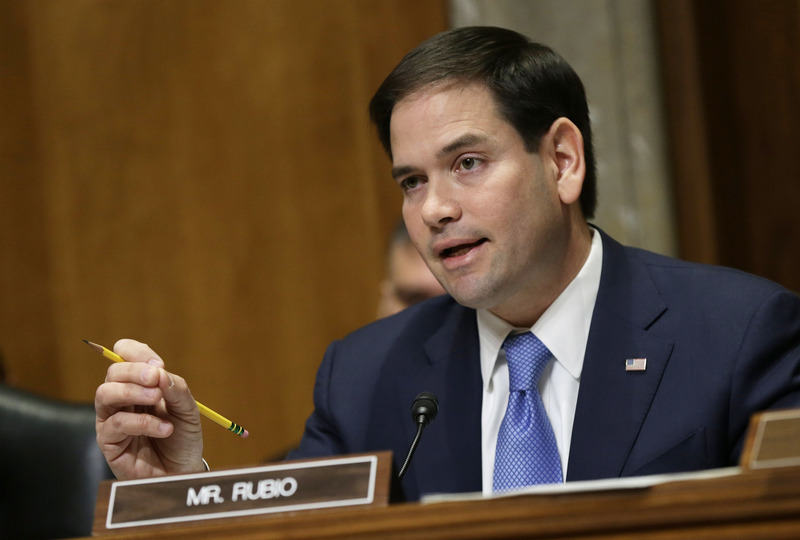 "[Rubio's] foreign policy motto seems to be, 'The enemy of my enemy is my enemy,'" wrote Washington political reporter Robert Merry in an op-ed for The National Interest last month. "Not exactly a brilliant formula for foreign policy success." Indeed, while the Tea Party darling and lifelong politician has the smarts to back up his five-year tenure as senator, his role on the Senate Foreign Relations Committee was riddled with controversy. For example, after Rubio declared during his March CPAC speech that the reason President Obama refused to bomb ISIS was his unwillingness to "upset Iran," Secretary of State John Kerry took him to task during a Committee hearing, insisting that his accusations were "flat wrong." [Iran] wants us to destroy ISIS. They want to destroy ISIS. ISIS is a threat to them — it's a threat to the region. And I think you're misreading it if you think there isn't a mutual interest ... between every country in the region. They're not going to come out and openly support [boots on the ground] ... but they're not going to object [either]. In his own words, Rubio has more than once come out in favor of more aggressive military action in the Middle East. In a lengthy post for The Wall Street Journal in 2012, Rubio reinforced the need for a larger American presence in Syria to take out President Bashar al-Assad and the corrupt forces with which he has dominated the country's rebels and innocent civilians for so long. Diplomacy doesn't stand a chance in Syria unless the military balance tips against Assad. With Iran and Hezbollah now directly involved in the conflict—sending soldiers and weapons into Syria—the U.S. must stop insisting that arming the opposition will only make the violence worse. On paper, the plan looks foolproof. But on a meticulous level, the skewed balance of power that Rubio so desperately wants to believe will shatter on impact from American-allied force will likely do nothing to stave off the bloodbath that would ensue once fundamentalists begin their inevitable takeover. Rubio's suggestion that the United States be involved on a face-to-face level with every conflict in the Middle East stirs up controversy at every turn. "Those in the United States who advocate the notion that 'the enemy of your enemy is your friend' are deeply mistaken when it comes to Iran and the Islamic State," said Rubio in a Foreign Policy piece on March 24, after the junior senator's committee meeting with Kerry. "Despite their denials, it seems the Obama administration does not wish to upset the ayatollahs during the nuclear negotiations." Whether Rubio had short term memory loss regarding the slippery slope that is Middle Eastern politics, or had simply dismissed that part of the conversation with Secretary Kerry as unprofitable, is anyone's guess. Most recently, Rubio put forth an amendment to the recent Senate bill (which conservative legislators are using as a partisan maneuver to discredit the Obama administration's negotiations with Iran) that would force Iran to recognize Israel's right to exist. It was arguably political posturing, negligent of any of the finer points that go along with international diplomacy and peacekeeping. As Merry of The National Interest suggests, Rubio might one day make a fine president and leader of the free world. But, possibly, not at the moment.